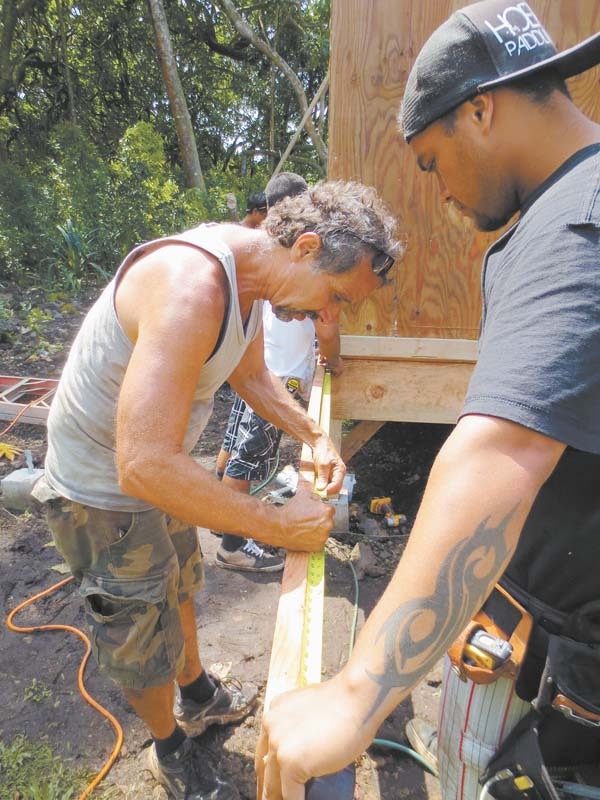 After 19 years of teaching students how to build cottages for kupuna and classrooms for their school, Rick Rutiz is stepping down as executive director of Ma Ka Hana Ka ‘Ike. The longtime Hana resident will be retiring from the nonprofit on July 1, handing over the reins to the young people he’s mentored over the past two decades. 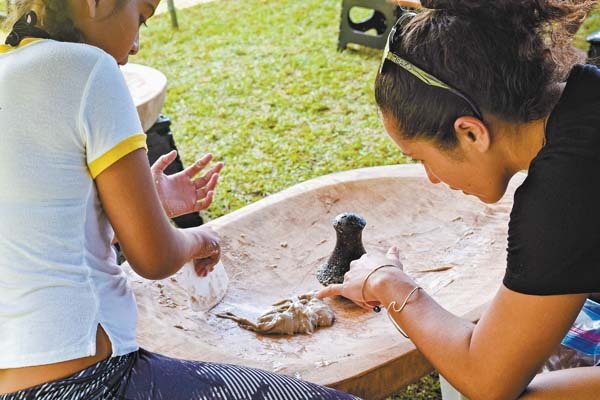 Ma Ka Hana Ka ‘Ike (in working, one learns) gives youths in Hana an education outside of the traditional classroom, teaching them hands-on building skills that not only help the community but could lead to a future career. 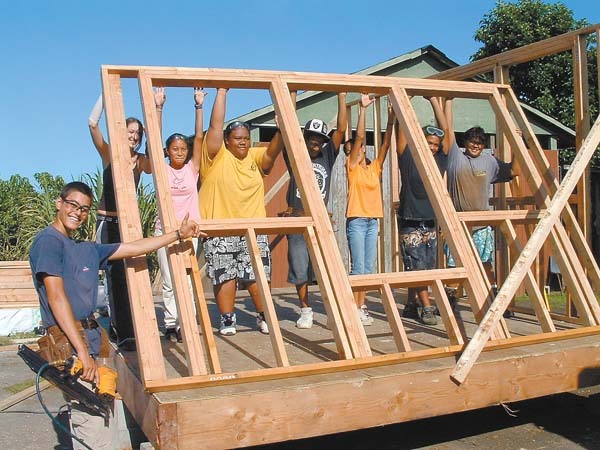 Over the years, students in the program have built classrooms for Hana High and Elementary School, cottages and handicap ramps for kupuna and solar-powered bathhouses for large families. Rick Rutiz (left), executive director of Ma Ka Hana Ka ‘Ike, takes measurements on a job site in Hana in March of 2013. After 19 years of teaching hands-on building skills to students, Rutiz will retire from the nonprofit on July 1. Part of the reason Rutiz connects so well with the youths in his program is because he used to be like them — a kid who learned better outside of the classroom. He went to college because that was “the thing to do.” But it was 1971, the Vietnam War was dragging on, and all Rutiz really did during his freshman year was party and protest the war. After one year at the University of California, Irvine, he left and found his way to Paris, where he ran out of money and squatted in derelict buildings until he landed a job as a chef. Near the end of his six years in Paris, Rutiz had the chance to open a restaurant in a converted marble and granite fabrication building. Lipoa Kahaleuahi (right), a graduate of Ma Ka Hana Ka ‘Ike, instructs a student while pounding kalo in Hana in 2017. Kahaleuahi is poised to take over as executive director of the nonprofit once Rutiz retires in July. Rutiz then spent three years teaching at a bush school in Kenya, where he and the other staff had to construct their own buildings. When Rutiz came back to the U.S., he decided to turn his passion for building into a business, and has now been a licensed contractor for more than 35 years. In 1986, Rutiz moved to Maui, where he taught math at Hana School, helped coach baseball and soccer and got involved in his daughter’s hula halau. As he worked more with the youths in the community, he saw kids with strengths that couldn’t be measured on a standardized test, who grew up hunting and fishing and were great with their hands, but felt stifled in the classroom setting. Rutiz started teaching building and construction at the school and began building classrooms with the kids. He recalled their first classroom blessing, and how a couple hundred people showed up and walked around with their mouths agape at what the students had done. “Things changed from that moment on, seeing the pride and success in the eyes of the kids, and just the awe in the community,” Rutiz said. Around the nonprofit’s third year, one of the students in the program lost his home to a fire. The next day at school, the kids said, “We could build braddah a house,” said Rutiz, who was skeptical at first. But he worked with the students to design a small cottage. They called local suppliers and got 95 percent of the materials donated. “The day after Thanksgiving, 50 people showed up on Friday morning in the pouring rain, and in the most amazing, chaotic, crazy wonderful three-day period, the kids manifested this cottage,” Rutiz said. After three straight days of rain and hard work, the family was ready to move in. “It was just chicken skin the way it was a whole community effort led by the kids and the power of their decision, of them wanting to get involved and the confidence in themselves that they could do this,” Rutiz said. Ma Ka Hana Ka ‘Ike has since expanded to include the Mahele Farm program, a 10-acre project of homegrown food that is shared with the community, and the Malama Haloa program, which is focused on kalo and helping families bring loi back to East Maui. Whatley, a journalist, author and Southern California native, met Rutiz in 2001, and the couple married in 2005. “He needed a grant writer, and he got a package deal,” Whatley said. “It’s pretty incredible to see what we seeded turn into this giant flowering, now fruiting tree with so many arms, so many hearts, just so many passionate people all kind of expressing their own visions of the different directions it can go,” Whatley said. Rutiz said Kahaleuahi will serve as deputy director until July. He added that while the program helps a lot of at-risk kids who struggle in the classroom, Kahaleuahi was the opposite. She was a straight-A student and “a very high achiever from Day 1” who loved the hands-on artistic work that Ma Ka Hana Ka ‘Ike did. She came back to Hana hoping to make a difference in the community. Program graduates make up the majority of the nonprofit’s 16 teachers, including James Freudenberg-Pu, a 2006 Hana High School graduate and the building program manager. Freudenberg-Pu was 14 when he joined Ma Ka Hana Ka ‘Ike. Reading and writing were not his forte, but he was gifted at working with his hands. As Freudenberg-Pu learned from Rutiz, his confidence grew. 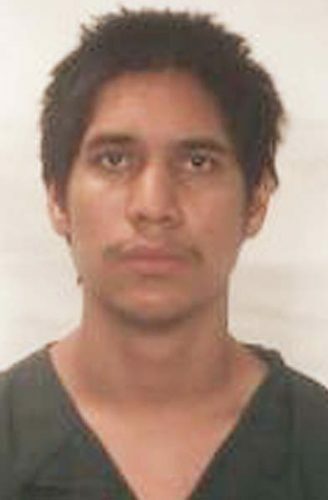 In his sophomore year, he began building a new home for his grandparents. Rutiz taught him how to draw up the blueprints and brought a crew around to help. Freudenberg-Pu worked every day after school and on weekends, and by his senior year, the home was complete. Freudenberg-Pu is now a father of two and has been head of the building program for 10 years. He said he wants to continue doing things for the kupuna in the community and create more project-based learning opportunities with Hana School. Freudenberg-Pu said he appreciates everything Rutiz and Whatley have done for the community. * Colleen Uechi can be reached at cuechi@mauinews.com. Matt Kuchar holds the champions trophy after the final round of the Sony Open, Sunday. Panelists Debra Finkiewicz (from left), owner of Maui Closet Co.; Diane Haynes Woodburn, publisher of Maui No Ka ‘Oi magazine; and Alyson Winters, district manager of Food Pantry, talk story about sales, marketing and customer service at the Maui Brainstormers “Rock Your Business in 2019” event Jan. 3 at the Maui County Business Resource Center.